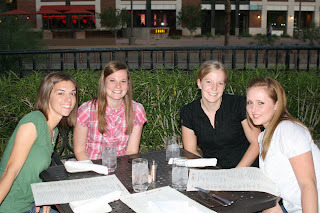 Once a month for the last eight months or so, I have gotten together with three incredible girls from Red Mountain. Each time we have done something different, it started out as getting together for coffee at Starbucks, then breakfast at Einsteins Bagels then La Grande Orange, dinner and classic movie nights and last night, dinner in Scottsdale. 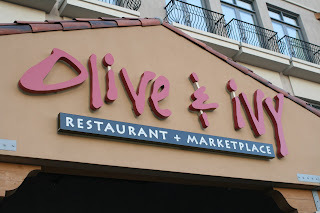 We all met up after work at Olive and Ivy, a restaurant that is part of Fox Restaurant Concepts. 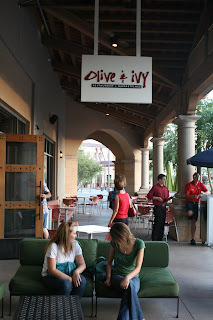 This place was very busy and full of many of the young business people of Scottsdale. We got a seat outside, on the waterfront ie, the canal and got to enjoy the beautiful weather. We enjoyed drinks, shared flat bread pizzas, salads and hummus and then got some incredible desserts. My time that I spend with these women has been one of the highlights of each month since we began hanging out last spring. During the summer it was hard for us to find time to get together so we took a few months off and I missed these women. We are all in different places in our lives and we each have very different personalities but it doesn't seem to matter, we always have a blast. When Joel and I moved from Portland to Phoenix almost a year ago I knew that this is what I would probably miss the most. In Portland I would often get together with a group of girlfriends and go out for Happy Hour at McMenamins or Stanfords or meet up on a Saturday morning for breakfast at one of a number of our favorite cafes on Hawthorne or Belmont. For the first few months that we were here in Mesa, I wondered if I would find women here to have similar experiences. God has blessed me in providing these friendships and I am excited to see what we do next, we already have some fun ideas but I don't want to say what they are so that I can write about them after we do them, but let me tell you I am excited about them! Katie, Thanks for your encouraging words on my blog...it is truly a new lifestyle and I have lost weight in the last year because of my son's allergies and the lack of eating out. It is calming to hear other people's resolve in dealing with such an altering way of life. what a great blessing to have found a circle of girl friends...looks like fun!